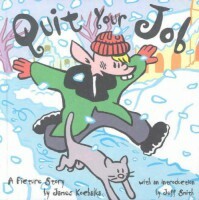 Quit your job and other stories are collected works of James Kolchalka. The first story is the longest (and my favorite). It's about a man and his cat, they find a magic ring, go on an adventure, have cake and one of them even goes to space. It's a fun story, with all these twists so that I'd never guess what's coming next. I loved all the details that went into the story, the mundane workaday world, the longing for something more and finally the realization that sometimes mundanity is kind of a comfort and when things change to affect that, it can be difficult. I loved the message that was left on his answering machine at the end of the day. The magic of a adult snow day. The second story is about an artist and Adam. The story switches back and forth between God creating the universe and the sad tale of an artist struggling with his fragility and inability to control his artwork as he used to do. The third story is the continued adventures of that dunce Adam. This time the insect brings him a robot friend to keep him company (perhaps in the hopes that Adam might actually learn something). Their first interaction, however, does not go well. 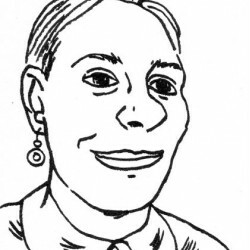 A really fun selection of stories, for those unfamiliar with Kochalka (fix that) this would be a great way to start.